Steel Yard Ramps (SYS) | Dock Door Systems Inc.
Portable Steel Yard Ramps also known as Mobile Loading Dock Ramps make unloading trucks and railcars easy. Quickly unload freight where no dock access exists. Portable Yard Ramps facilitate unloading safely and efficiently. 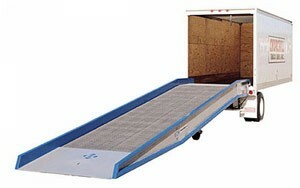 Dock access is no longer a problem when a portable yard ramp is available. The hydraulic system allows for smooth and quick raising of the front lip of the yard ramp to the proper dock or trailer height. Simply open the release valve to safely lower the unit into position. The pump is mounted internally to protect it from accidental damage. Heavy-duty wheels and solid rubber, pneumatic profile tires make positioning yard ramps easy. For stationary dock installations, standard Yard ramps are available in 30' and 36' lengths without wheel assemblies. The optional ramp clamp assists operator in moving yard ramps over short distances. Forklift tine inserts into the swiveling lift loop and is secured by a locking device. Standard safety chains hold yard ramps securely to the trailer or dock. The optional towbar features a fast-locking, easy hook-up to yard ramps and makes towing over long distances practical. A quick disconnect feature improves handling efficiency.